Did you host a SuperBowl Party Sunday? Left with a big mess? Let us help you clean up around the house after the game. 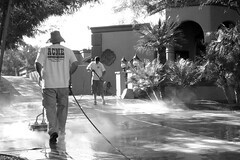 Our power washers use high-pressure steam up to 300°F at 3500 psi to blast away spills, grease, grime, dirt and debris. We can quickly clean off your patios, courtyards, driveways, and even the exterior of your home! Even if you didn’t host a party recently we can help clean up after the recent wind storms last week or maybe that mess that has been bugging you for a long time now. As always, power washing estimates are free, 24/7/365 – 602-373-1515.